Zone wall shelf has four glass shelves. Zone wall shelf has four glass shelves. The glass sits proud on the frame supports making a feature of the polished edges. Shelf spacing is graduated to make it easy for storing both tall and short items. Adhesive silicone pads hold the shelves in place. 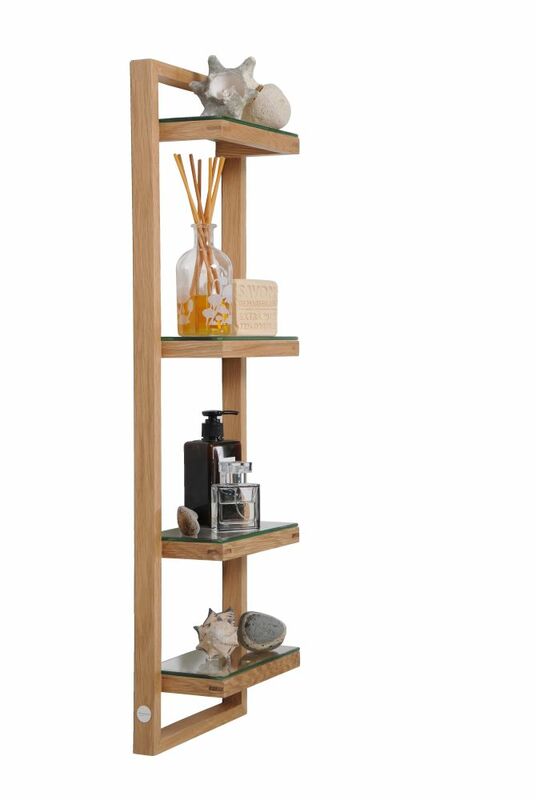 The solid oak frame is assembled using fillet joints for strength and rigidity. Concealed wall fixings keep the appearance uncluttered. Zone wall shelf is the same height as the Zone 800 mirror cabinet. Positioned together they make a complimentary pairing. Made from American white oak, finished with a matt, water resistant lacquer.